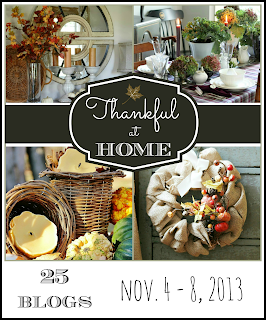 I'm so thrilled to be joining 24 other bloggers this week as we share a "Thankful At Home" tour. I also would love for you to visit all the other great gals sharing in this Thankful At Home tour. As always, Kim, your table is beautiful! There are so many wonderful details. I love those chargers and am sad I missed those at PB. Your plates are gorgeous and I adore the black and white ones especially. Everything is put together expertly and it's so cozy and welcoming. Thank you for inviting me to participate, Julie. Oh how I loved seeing that gorgeous table.....so wonderful to learn about your family traditions...have fun at your daughter's this year! Thanks, girl and I hope I have fun, but will be doing a lot of work, too. I totally love that centerpiece! Our Thanksgiving is always just the three of us, and it's extra-special now that Abby is in college and we are really missing each other by the time the holidays roll around. We have a couple of things that we always make -- my Tamale Cornbread Dressing and Roasted Garlic Mashed Potatoes. I change up the turkey sometimes and this year we are frying one with spicy Cajun seasoning. But the real tradition is that we always turn our Christmas lights on for the first time that night! We make a fire out front and neighbors and friends drop by. It makes up for not seeing our families until Christmas. Off to see the tour, thanks for sharing, Kim!! Andrea, that all sounds like so much fun. Thanks for sharing! Your table looks great! I love hearing about your Thanksgiving traditions. They sound a lot like ours! Broccoli and Rice Casserole is a favorite. I'm sure your Thanksgiving at your daughter's house will be lovely. Your right, it's all about the company. No rice in this casserole, but it sure is good. I think I may make him taste it this year. He is long overdue. Your table is gorgeous Kim! I loved hearing about your traditions. It's a wonderful time of year, I know you will enjoy. Your tablescape is gorgeous. Love the chicken wire chargers. We always have Thanksgiving at my sister-in-law's home and we all bring a side. We usually do dessert and some type of salad. I typically host a brunch on Christmas. Love having family close by, too! Thanks Mary for sharing your tradition. Gorgeous table Kim. I really love those chargers and centerpiece! Your table is beautiful. We go to my sister in laws for Thanksgiving. This year, I host Christmas. Every year for every.single. family get together, I make Broccoli-Rice Casserole. One year my sister in law and I decided we needed to change the menu... to which I was presented by my 10 year old niece, a petition with everyone's signature to never delete the Broccoli-Rice casserole again. Somehow there was a paw print signature of a family pet too.... humm. SO I guess I know what I HAVE to bring to everything for ever and ever amen! That is so funny with the added paw print. No rice in mine, but I like any broccoli casserole. Kim I love your wooden box full with Autumanal colors and textures, so pretty in your home. I think our whole dinner is pretty traditional, but I always add a bit of a twist with a new appetizer and a veggie dish just to keep people guessing, LOL. We, too eat like there is no tomorrow and then we always have My Mom's apple, walnut, pecan and pumpkin pie for dessert. such a wonderful family time, Love getting together with family. Thank you for sharing your time with us. Kathysue, those pies sound wonderful. Sometimes I like to introduce something new to the menu, too. What a magnificent table!- love all the thoughtful details- the unique chargers, charming pinecone turkey and sweet squirrel- and the vintage plates are lovely.Dinner at your place must be a tough act to follow! Sweet Kim! I loved hearing about your Thanksgiving Traditions! I think tradition is the glue of family generations! We always eat the same thing at Thanksgiving every year too! You certainly set a beautiful table! I love those Chargers!!!! You must be so proud to have another generation of your family hosting Thanksgiving! I think that table-scape is the prettiest one you have done...its gorgeous! Thanks for sharing your beautiful table today, Kim. I always love your style and taste. I LOVE the mixed patterned silverware! It's a fun way to express your creativity. My kids bought me a new set of matching silverware, because, they thought the silverware should match. Silly kids!! Thanks for sharing all of your Thanksgiving details and ideas! I'm ready to waddle home, too, Kim … love Thanksgiving! Too bad you're not hosting it this year, as your tablescape is gorgeous … love your centerpiece and dishes! I'm sure you'll help your daughter make hers just as pretty and inviting! Thanks, Becca. Yes, I will probably be worked to death, but all worth it. Your dining room setting looks "House Beautiful" worthy! You should throw a little dinner party and enjoy yourself. Hope your daughter enjoys the Thanksgiving prep as much as you do. I think it's at least half the fun! Kim your table is laden with loveliness! Just perfect! How exciting that your daughter is hosting her first Thanksgiving…it will be perfect I am sure. Your post has left me wondering how I missed those pottery barn chicken wire chargers. I LOVE them! Thank you so much for kicking off our tour in such style! I think they need to bring those chargers back because everybody wants them. Kim your table is so perfect for Thanksgiving or anytime! I would suggest you leave it up until after Thanksgiving at your daughter's home and serve leftovers at the table the next day. Even if the leftovers are turkey sandwiches. Thank you for sharing your traditions. Thanks so much, Therese. Yes, lots of waddling. Kim, you should tell these little family stories more often; so enjoyed reading about your special traditions and all the interesting tidbits about everyone's preferences and thoughts! I love your pheasant plates, they're so seasonally perfect! Gorgeous! You've outdone yourself on this one! So beautiful and I loved reading about your traditions - I am sure your daughter will do a great job! Beautiful table! Of course, your entire home is gorgeous. It's great that you take turns hostessing and I'm sure your daughter will be fine. All the food sounds so good right now ~ I'm starving!! Thanks, Melissa. I really enjoyed your post. Your squirrel shaker has caught my eye several times. It's adorable, and I hope to order it from PB today. We host Thanksgiving dinner, thirty-two yrs., but my younger sister prepares the turkey, dressing, and gravy. She the best! I'm sure your lovely daughter will be the perfect hostess following in her mother's footsteps. Thanks, Deb. Yes, he needs to at least taste it. Wow, do you set a beautiful table. I have never lived near family as an adult, so I already love the fact that all of you take turns hosting. Now, it feels like Fall. I used to do Thanksgiving, Christmas eve AND Christmas every darn year! I am THANKFUL that now my daughter has taken over most of the holidays. I only do Christmasd Eve or Day now. I LOVED hearing about your traditions. We, too, have the same menu every year cause everyone loves it all. We eat like we have never eaten too, but it is so GOOD:):) I am anxious to see all the blogs in this party this week. Your table looks bEAUTIFUL, I love those chargers and the dishes are exquisite. Wow, Pinky, that was a lot for just you to do. Glad you have help now. Looks beautiful and I know you will all have a wonderful time! Oh, yea, he's a regular riot! Beautiful table Kim! Fun having your daughter begin hosting holidays, what a blessing to watch our girls take on more and more exciting roles in their adult lives! Thanks, Cindy. Yes, it is nice to see her take her grandmother's place. I started way younger than her. Your table setting is great Kim. I love the vintage bird plates and mixed silver. Your traditions sound very similar to mine when I grew up and then lived near my family. Now, one of my sons comes for the weekend. We all decided last year that we are not big fans of turkey, so we are creating our own new traditions this year. I was wondering about your new post today! It didn't show up on my blog roll. That's how I know who has posted a new post. Yours was still showing yesterday's post and I knew that you were scheduled for this party. Common Ground blog said some people's blog posts are not getting updated on blog rolls for some reason. Yours was one of them. Anyway.........that is why I'm just now seeing your post. I love your table setting! The wire chargers are so perfect with the casual centerpiece and striped napkins. I love a country style table setting. Thanks and it still isn't updating. Not sure why. Hope it gets fixed. I am sure your daughter will do a fabulous job this year - how exciting. Your dining room tablescape looks lovely. You are so lucky to be able to get together with family during the holidays. Your table is wonderful! And I love reading about your traditions. We don't celebrate Thanksgiving here but I enjoy all your great plans. Loved your post! Your table was beautiful! Also loved hearing about all of the good food you'll be enjoying! But what caught my eye was the pine cone turkey! Fabulous! Curious if you made it and how! I want one! Kara, I bought those at World Market last year. Oh... luv your family gatherings. They sound so cozy and fun. Alas we have a rather mundane Thanksgiving ... we were always away. We would take a villa in Orlando and do the theme park thing when the boys were younger. Then as they got older, we went on a cruise... Now my eldest is married and we need to change things up a bit. We ( Mom and dad) will be away on a previously arranged outing, but next year we will have to plan a new tradition. I love your table! Very pretty! What a gorgeous thanksgiving table, I do love the chicken wire plates, I have not seen anything like this before, I am heading over to pottery barn now as I believe they ship to New Zealand now. I love all the gorgeous details, Kim! It's funny you mentioned how the same folks bring the same sides...same thing happens at our house when we host Thanksgiving! I guess that's pretty common! I am just glad our family members bring side dishes. We end up hosting around 20 each year and that's a huge crowd for just one person to cook for! What a gorgeous table setting, Kim! Loved hearing about how your family does holidays. You are so blessed to be able to create so many family holiday memories together. I'm sure this will feel extra special with your daughter hosting for the first time. I haven't been with my parents and siblings for Thanksgiving in many years, but am going to try hard to get to them at Christmas time this year. Thanks for sharing all the beautiful details of your table! Your tablescape is so pretty & inviting! for about 7 years, I've been hosting Thanksgiving & Christmas Eve. (I'm an only child). My parents, our two sons, daughters in law, and three grandsons will join us. Our daughters-in-law both have family nearby, so the kids leave late afternoon/early evening to visit with the other sides. We celebrate on Christmas Eve, & both daughters-in-law have their celebration on Christmas Day, which works out perfectly! Very pretty table, have a wonderful time with your Daughter. Sounds like fun and great memories. These are things we cherish forever. Hi Kim, this is a lovely tablescape. Just gorgeous. I love all the pretty little details, they work so well together. The coordinated pheasant theme makes the arrangement all the more stunning. I'm glad I popped over. I am having a very real case of chicken wire charger envy. I've been searching around town for pheasants to no avail. This is a beautiful table and love those chargers. Sandra Lee, I found those at Hobby Lobby a couple years ago, but I believe they carry them each year and they come in a wood color. I enhanced them with some gold guilding paste. Oh Kim, this is a gorgeous table-setting! Those chicken wire chargers are adorable, cannot keep my eyes off them! I enjoyed reading about your family traditions with the holidays, A big family reunion around Christmas sounds fun! I am sure Thanksgiving will be a lot of fun at your daughters too. I always do Christmas Eve for my family. It is much less work, sort of, then Thanksgiving. Love the addition of the pheasants to the centerpiece. Your tablescape looks fallicious and beautiful....love the mix of plates & patterns you've used! I'm sure your daughter will do just fine..I remember the first time I hosted Thanksgiving after getting married and I was a nervous wreck. Tell her to sip some wine, have music on and most of all just laugh & enjoy those that are there...that's the most important part I've learned over all these years....and always have some leftover turkey of course! LOl! Happy Fall to you all! I sure enjoyed hearing about your Thanksgiving dinner traditions and especially about all the yummy food. I make broccoli casserole too! I'm still crazy about your PB chicken wire chargers. The story you told of your Thanksgiving tradition just enhanced your beautiful tablescape photos. I enjoyed hearing about who brings what, and how you share holidays. I have similar black and white dishes, and you gave me an idea to pair them with patterned dishes, rather than the plain ones I've been using. And I sure hope Pottery Barn still sells those chicken wire chargers -- I love them! Fun post, Kim! Kim, what a fabulous tablescape! I love your china and the layers you added. Your centerpiece is gorgeous; pheasants just say, "harvest and Fall" to me. Your dining room is a perfect color to accent all the colors of Fall. Thanks for sharing your Thanksgiving traditions! I so look forward to Thanksgiving which is the only holiday I still host. It's a time just to enjoy being together and appreciate our many blessings. The table setting will be simple and the food bountiful! Here's to the enjoyment of the season. Wow Kim, it's stellar. So wish I could see your gorgeous home in person some day!! Kim, your dining room is one of my favorites. Each detail is gorgeous! Makes me want to pull up a chair and dine at your table. Love the fall centerpiece and your tablescape. Enjoy the day with your daughter and her family! Confession - I think broccoli stinks too - but my hubby loves it so I let it stay!! Wow, this is such an incredibly beautiful dining room! You have put such attention to detail and so well put together! I love it! Your dining room and table setting are wonderful. We will be home for Thanksgiving and are doing something different this year. We will actually have turkey. No one in our family likes turkey so we usually have lobster - hey our forefathers probably ate lobster at that first Thanksgiving meal. But, my daughter wants to try making a turkey and everything that goes with it. In 42 years of marriage I have never made a turkey so this will be a first. Your table is absolutely gorgeous Kim! Love, love, love your centerpiece! Your table looks beautiful Kim! I love those chicken wire chargers! Thank you so much for the feature, it made my night! Just beautiful, Kim. I'm sure your daughter will do a wonderful job, as I'm positive she has inherited her mom's good taste. Your Thanksgiving traditions sound wonderful, Kim...and your centerpiece is stunning! I'm with you...it's all about who we share the day with!